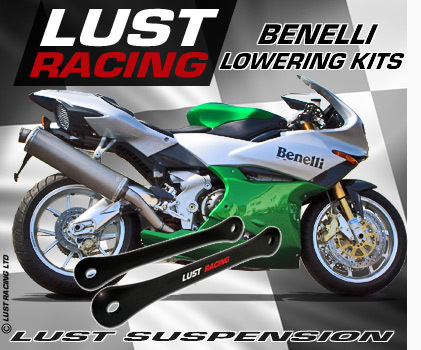 High quality lowering kits for Benelli motorcycles by LUST Racing. Lowering kits made in roll forged stronger than the standard links replaced. Made to exact tolearances for for perfect fit. Excellent finish in black powder coating with LUST Racing logo in red and silver-chrome. Installation instructions included. Recommended aftermarket accessory for riders who find their Benelli motorbike to tall to reach to the ground properly with both feet. Installing a rear suspension lowering kit will reduce the seat height.